A new Prince William County business is changing how people play laser tag. Earlier this year, Team Tactics opened at the corner of Smoketown Road and Golanksy Boulevard in Woodbridge. 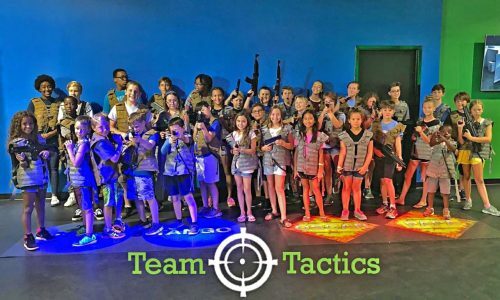 Team Tactics isn’t your average laser tag business. It offers unique arenas, an array of weapons, and a different focus. Visitors have three settings they can choose from — an office, a warehouse or a market. The market arena offers moveable props, according to Tanya Cooley, who’s involved in Team Tactics’ market development. “Our combatants will go in there before the mission begins and build forts,” Cooley said. Players can pick from an assortment of realistic weapons, such as pistols, shotguns, FN P90, and submachine gun (SMG). During their mission, they wear vests that have three sensors located over the heart, on the shoulder and on the back. “It’s not just pointing and shooting, you actually have to shoot at the sensors,” Cooley explained. Unlike many laser tag businesses, Team Tactics centers its missions around specific purposes, such as discovering the traitor.